As some of you will already know, I am one of 7 US academics being investigated by US Representative Raúl Grijalva (D-AZ) who is the ranking member of the House of Representatives Committee on Environment and Natural Resources. Rep. Grijalva has sent a letter to the president of my university requesting a range of information, including my correspondence, the letter is here in PDF. Before continuing, let me make one point abundantly clear: I have no funding, declared or undeclared, with any fossil fuel company or interest. I never have. Representative Grijalva knows this too, because when I have testified before the US Congress, I have disclosed my funding and possible conflicts of interest. So I know with complete certainty that this investigation is a politically-motivated “witch hunt” designed to intimidate me (and others) and to smear my name. For instance, the Congressman and his staff, along with compliant journalists, are busy characterizing me in public as a “climate skeptic” opposed to action on climate change. This of course is a lie. I have written a book calling for a carbon tax, I have publicly supported President Obama’s proposed EPA carbon regulations, and I have just published another book strongly defending the scientific assessment of the IPCC with respect to disasters and climate change. All of this is public record, so the smears against me must be an intentional effort to delegitimize my academic research. The letter goes on to note that John Holdren, President Obama’s science advisor, “has highlighted what he believes were serious misstatements by Prof. Pielke.” (For background on this see here and here.) My 2013 testimony to the Senate is here and House is here in pdf (Q&A following hearing here and here). The testimony was the basis for my recent book on Disasters & Climate Change. Congressman Grijalva doesn’t have any evidence of any wrongdoing on my part, either ethical or legal, because there is none. He simply disagrees with the substance of my testimony – which is based on peer-reviewed research funded by the US taxpayer, and which also happens to be the consensus of the IPCC (despite Holdren’s incorrect views). I am pleased that some colleagues with whom I have had professional disagreements with in the past have condemned the investigation via Twitter, among them Eric Steig (of Real Climate), Bob Ward (LSE) and Simon Donner (UBC). This shows some real class. In contrast, Michael E. Mann, who I defended when a Virginia politician came after him, used the “investigation” as a chance to lob childish insults my way via Twitter. Some things you can always count on in the climate arena! So far, I have been contacted by only 2 reporters at relatively small media outlets. I’d say that the lack of interest in a politician coming after academics is surprising, but to be honest, pretty much nothing surprises me in the climate debate anymore. Even so, there is simply no excuse for any reporter to repeat incorrect claims made about me, given how easy I am to find and just ask. When “witch hunts” are deemed legitimate in the context of popular causes, we will have fully turned science into just another arena for the exercise of power politics. The result is a big loss for both science and politics. The graph above is an update from a version I first showed in Congressional testimony in 2013 (PDF). It shows US flood damage (as recorded by the NWS in 2013 $) as a proportion of US GDP (as recorded by the OMB, also in 2013 $, Table 10.1 here). The graph starts in 1940 because this is the start of the OMB GDP dataset. The US is prone to very large flood events, resulting in tens of billions of dollars in losses. However, the trend since 1940 is striking. As the nation has seen its economic activity expand by a factor of almost 13, flood losses as a proportion of that activity have dropped by about 75%. Please don’t use this data to say anything about the incidence of flooding in the US or changes in climate. For that, I urge you to look at data and research, discussed here. You’ll find very little evidence of increasing flood frequency or magnitude either in the US or globally. 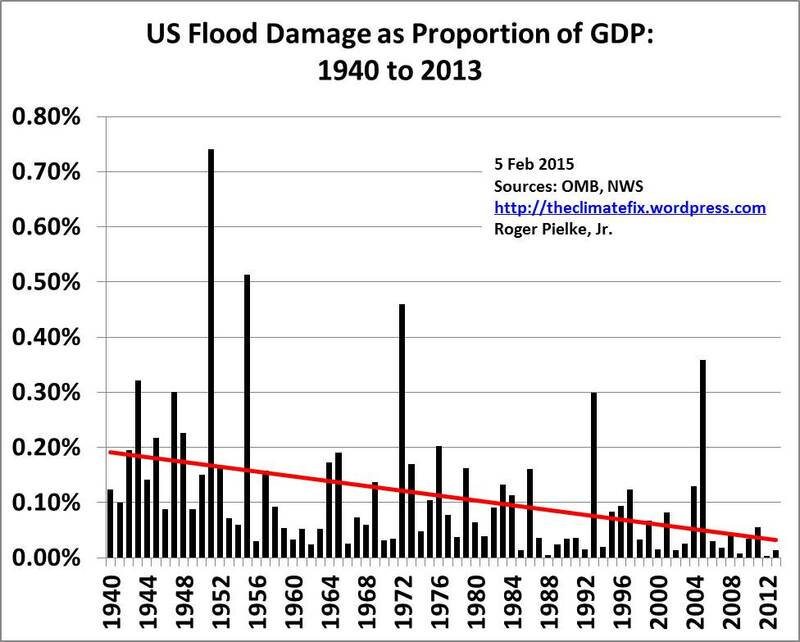 Regardless, the diminishing economic impact of floods in the US is undeniable. At The Breakthrough Institute (where FYI I am a Senior Fellow) last December, Arthur Yip has produced a very nice analysis. The graph above shows the implications of various policy commitments for future trends in the proportion of energy consumption from carbon-free sources for the US, Europe and China. Such an analysis requires making a range of assumptions, which obviously could be made differently (e.g., Europe will be 11% nuclear in 2030). The graph above shows that the US, Europe and China have expressed an intention to put into place policies that will support a continuation of a long-term trend in the decarbonization of energy consumption. However, even if these policies are 100% successfully implemented, they will only decrease the world’s reliance on fossil fuels by a small amount in 2030 (FYI, today’s proportion is about 87%, where it has been for about the past 20 years). “Success” at the upcoming Paris negotiations has come to mean locking in this general approach. While people will no doubt continue to enjoy debating about and witnessing to climate policies, the fact is, at the meta-level, that debate is pretty much over. Climate policy has entered its middle aged years. Yip’s full analysis, including a focus on China, goes into a lot more detail. Have a look here.